The Altador Cup is back for another year, and what would it be without everyone's favorite character: the Techo super-fan! In Make Some Noise, you help this crazy Techo support his favorite tournament by creating a whole lot of noise! This game is really easy to play. At the start of each game you're given two keys to tap alternately, raising the Techo's sound meter. The faster you tap them, the higher the sound meter goes! The keys are different each time you play. It's random which two you get. You should be trying to tap them alternately, i.e. first one then the other, then the first one again and so on. Your sound meter will still go up if you don't tap alternately, but your Tap Skill Rating will go down. The Tap Skill Rating is a percentage bonus that you get when you submit your points. A higher rating means more points! While you're tapping, watch out for Bonus Keys. These appear along the top of the screen and award you extra points when you tap the corresponding key on your keyboard! You will want to try to hit them as soon as you can after they appear on-screen, because you get more points the quicker you are. Finally, you can either wait for the timer to run out and your score will auto-submit, or you can hit the spacebar at any time to submit the score you have at that point. Instead of submitting your score early, let the timer run out and auto-submit your score. It's one less thing to worry about and it gives you more opportunity to get bonus keys too! 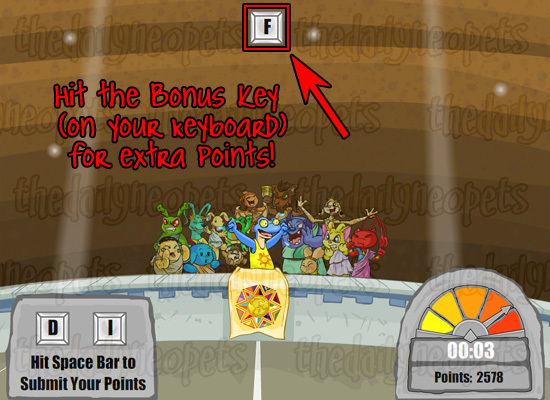 To make the game a little easier you can restart the game until you get two keys that are close together. That way, you can have one hand doing the alternate tapping, and the other free for hitting the bonus as quickly as possible! Overall, this is a pretty simple game. It's good for a break when you're getting bored with all that Yooyuball. Just try not to make *too* much noise - you might break your keyboard! The Snowager is awake. He'll be sleeping in 2 hours, 14 minutes.